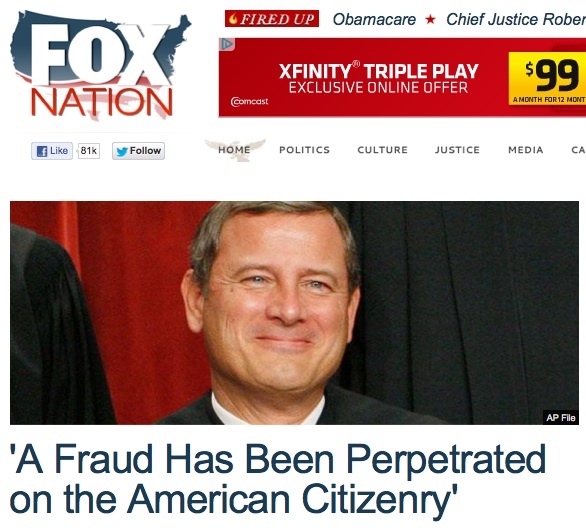 Although Fox Nation likes to boast about how much it loves America "and its ideals," the site is nonetheless trumpeting that the United States' Supreme Court ruling that upheld President Obama's health care reform is "a fraud." Notice how Fox Nation cagily put quotation marks around the headline, thereby outsourcing and feigning distance from the person who actually said a fraud has perpretated on Americans? Critics of the majority's decision will say for the foreseeable future that Chief Justice Roberts rewrote Obamacare to save it. Michael Carvin, who argued against Obamacare before the Supreme Court, noted dryly, "I'm glad he rewrote the statute instead of the Constitution." The Fox Nation post is a reprint from the conservative publication, The American Spectator whose own title of the piece is the far less inflammatory Roberts Too Clever By Half. It's Fox News spin 101. Find someone else to say something incendiary to demonize whatever issue or person they're against, promote it as big news and then pretend to just be reporting. I’d suppose I should be concerned — but, since the denizens of FoKKKsNation have about as much legal expertise/authority as Limpy . . .
A) Roberts handed Romney the election, while ensuring his (almost identical) plan can be enstated unchallenged. B) He’s a traitor! Impeach him or we’ll kill him! The real frauds in this case are Scalia, Thomas and Alito. Despite their oath to follow the Constitution, they routinely legislate their right-wing agenda from the bench. Thomas is the worst of the three as he has the legal IQ of a kumquat.